Click here to view the event summary and key points from the full videoconference. 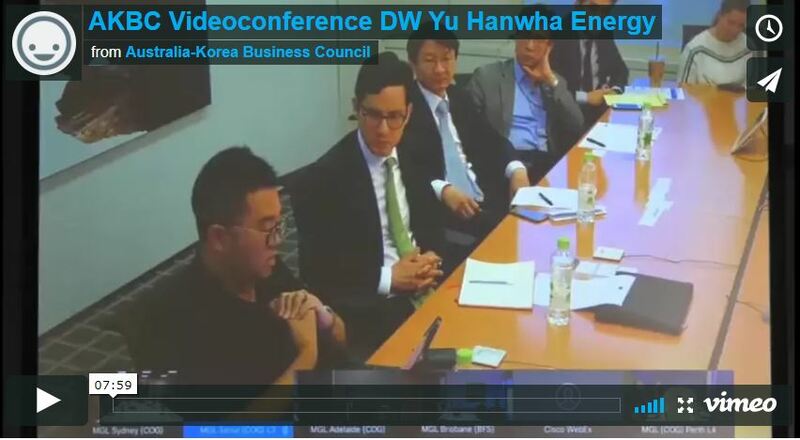 Mr Daewon Yu, Hanwha Energy spoke at the AKBC Videoconference on infrastructure, energy and resources opportunities between Australia and Korea. The video below shows his speech, where he talks about renewable opportunities and Hanwha’s appetite for further investment into Australia. 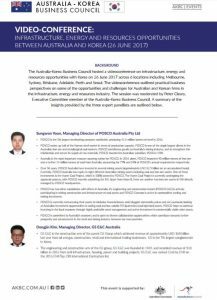 Mr SW Yoon, MD of POSCO Australia also spoke at the AKBC Videoconference The video below is SW Yooon’s speech from the videoconference, where he talks about POSCO’s relationship with Australia. Australia-Korea Foundation Grants Now Open!